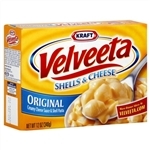 Kraft Velveetta Shells and Cheese - Original - 12 oz 340g CASE of 24 PACKS Shells and Cheese - Original. Creamy cheese sauce and shell pasta. Now more Velveetta flavor! Excellent source of calcium for strong bones and bodies. Good source of protein. Enriched Macaroni Product (Wheat Flour, Durum Wheat Flour, Glyceryl Monostearate, Niacin, Ferrous Sulfate [Iron], Thiamin Mononitrate [Vitamin B1], Riboflavin [Vitamin B2], Folic Acid); Cheese Sauce (Milk, Whey, Water, Canola Oil, Milk Protein Concentrate, Sodium Phosphate, Salt, Contains Less Than 2% of Sodium Alginate, Lactic Acid, Oleoresin Paprika [Color], Natural Flavor, Cheese Culture, Enzymes, Annatto [Color], Sorbic Acid As A Preservative). Contains; Wheat, Milk.